2018 was an amazing year for eCommerce so far, and Shopify was at the head of the game. From artisanal soaps to furniture to electronics, retailers all over the world showcased their products and made a solid income via the eCommerce channel. We took a look at some of Shopify’s most popular sites and created a shortlist of those we believe are the best Shopify stores in 2019. Note that the top 10 e-shops are not arranged in any particular ranking order. Tattly has a great site with a design that catches the eye but doesn’t overwhelm you. The big blocks of pictures are digestible, and the scroll keeps the content interesting and fresh. The site has a super simple navigation menu that lets you find exactly what you’re looking for, including different products, new items, bestsellers and more. Tattly also has a very slick and functional mobile site that makes it easy to browse and purchase on your phone. Once you enters the homepage, the pop-up appears towards the bottom that invites you to sign up for the newsletter. The fact that the signup is position towards the bottom makes it less intrusive of a shopping experience compared to standard pop-up that appears right in the middle of the page on entry. It doesn’t redirect you to another form; you can sign up right there on the homepage. Tattly uses Segment, which is a tool that lets you instrument your web app for analytics once, and then send your data to any number of analytics services. It’s the perfect way to further streamline your marketing analysis. Allbirds has a very cool, sleek website design that features high-quality and interesting visuals of Allbirds’ products and models featuring them. The site also includes an “about us” video that gives the company a more human edge. The navigation menu is one to admire — a simple, clickable drop-down that lets you head to the category you’re looking for. And the product pages feature a beautiful image of the product with seven or eight angles, a concise description, and shopping choices that make it easy to pick your size and check out. ContextWeb is a usage statistics software that gives you high-precision, real-time contextual advertising solutions that help to maximize the results and impact of online advertising. It’s a great way to get more bang for your marketing buck by putting your ads in front of the right eyes. This homepage seamlessly combines beautiful visuals with a short, informative video so you have all you need right in front of you. The colors are vivid and exciting, and the clean design makes it super appealing. The product pages don’t mess around either — you’ll find a crisp photo and a short description, and with one click you can add it to your cart and go. The site’s navigation menu breaks your options down into three categories for easy browsing. Yepnope is an asynchronous conditional resource loader that’s super-fast and allows you to load only the scripts that your users need. This is one of the best Shopify stores because it has a gorgeous and simple homepage that features everything you need to see in a clean layout: the products, their names and the prices. Scroll down and you’ll find a quick video ad, too. The navigation menu is a clickable pop-out that makes it simple to find the product you’re looking for or learn more about the company. And, if you can believe it, the site almost looks even better on mobile! Same great photos and layout with a simple scroll-down design and quick accessibility to purchase buttons and checkout. Viewport Meta is a tag that means the content can be optimized for mobile content. No wonder this site looks so good on mobile devices. Factory43 designed an awesome homepage with a clean, white background and scrolling images of products both on live models and set up on display. The scroll also features Factory43’s graphics, the main selling point of the brand’s tees. The navigation menu runs across the top so you can easily click around to various areas of the site to shop for merch. And the product pages are super cut and dry, featuring a large image of the product along with a pronounced Add to Cart button. This site gets props for the homepage design, which features cool, crisp photos showcasing the products, a smart description of the company’s mission and a place to sign up for the newsletter without overwhelming you with info. The mobile site has the same appeal — just a mini version of the real thing with easy navigation and shopping capabilities. Click through to WP Standard’s products pages and you’ll find beautiful picture galleries of the products with clearly presented info so you don’t have to dig for the details. AdRoll is a retargeting platform that makes display advertising simple for all sizes of business. 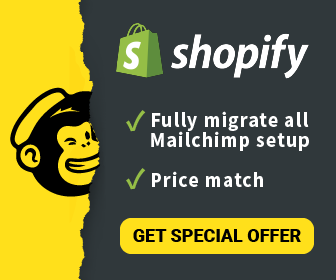 It’s a perfect advertising tool to kickstart your Shopify store by making your strategy even smarter. We love Beardbrand’s site not only because of the fantastic design, which is clean, compelling and well-organized, but also because it features a “What Type of Beardsman Are You?” quiz that helps you figure out your beard style and the ideal products for it. The navigation menu sits as a drop-down on the top left of the page and has four simple categories to click on. The site translates perfectly to mobile, where you can browse and shop with ease. Affiliatly for Shopify is an affiliate tracking software for eCommerce store owners that lets you gain traffic from referrals. To begin with, this store has one of the best Shopify store names ever. Period. Apart from that, this site’s design wins for its eye-popping colors. You meet with vivid pinks, turquoise, yellows, and blue – all the color that reminds you of a summer beach vacation – as you scroll down the homepage. The elegant design highlights the products and makes them even more appealing. Sun of a Beach has a great way to integrate community-generated content from Instagram as part of its marketing approach. It features Instagram Shop directly on the navigation bar and features great looking pictures with one-click to product integration. The product pages feature cool pictures and smart, elegant descriptions, and make it easy to choose patterns and colors before checking out. ContactPigeon is the Sun of a Beach’s eCommerce marketing automation tool of choice when it comes to generating behavior triggered campaigns via email and pop-ups. If a visitor abandons the site, the trigger will generate abandoned cart and browse reminders dependent on the stage of the visit. For popups, it gets triggered comes up when the software senses exit intent so you can grab a user’s email before they head out. Flatspot has a great homepage design, and it lets you float over products to see the basic details so you don’t have to click through to each product page initially. The product pages are clean and well-designed with photos of the products, basic details and a quick method of purchasing. And the navigation menu breaks down the various products into obvious categories so you can choose from drop-down menus under each category. Last Second Coupon by Hextom is a Shopify app that tries to increase revenue by turning more window shoppers into paying customers. If they are browsing products for a while, it will generate a coupon upon exit intent to try to coax them into buying. It’s no wonder Three Square Feet is one of the top Shopify stores. Its mobile site is sharp, clean-cut and edgy. It gets the message across in stark black and white, and provides a lot of useful information without being overwhelming. The navigation menu runs along the bottom of the page so you can hop to a different section whenever you like. And the product pages are sleek and crisp. Olark lets you chat with your website visitors while they browse, either on your mobile device or instant messenger. You can answer any questions they have while they’re shopping in order to increase the chances of making a sale. If you want to join the ranks of the best Shopify stores, it’s crucial to start assessing the ontactPigeon is the Sun of a Beach’sverall design and user browsing experience to make the website appealing on landing. It’s also good practice to invest in great marketing tools in 2019, as it can work alongside your site to enhance visitor experiences. Including as part of your strategy and continuing to devote efforts to your store will help you boost your traffic and revenue in the years to come — and maybe you’ll even end up on the list of Shopify’s Top 10 stores!